I noticed a new topic in the Expat Blog Hop and decided now it is my time to make a contribution. When it came apparent that I would move to the Netherlands, I started googling for information. I was happy to find several expat blogs describing the adventures of relocating to the Netherlands - besides information it also proved that people have survived here without going completely crazy :) One of the blogs I stumbled on also had a weekly topic for other blog writer's called the Expat Blog Hop. I decided that on some beautiful day I will also start participating, and now that day is finally here, although rather rainy and grey. Path 1 - Crazy dutch dishwashing people! I was few weeks ago in a place with relatively many Finnish women who live in the Netherlands. As it happened, I ended up helping in doing the dishes after we were ending the gathering. I did the dishwashing according to the hygienic and following the health standards like any good, well-raised and overly hygienic Finn would do: first wet the item you are washing, then apply soap, rinse the soap, dry the thing and voila, you are ready. One of the Finnish women commented that if we would have Dutch people here, they would be upset by the amount of water we are wasting, which led us to an interesting discussion. I learned, that apparently the step called "rinsing-the-unhealthy-and-toxic-soap-from-the-thing-you-are-eating-your-food-from" -step is not an universal step in the art of washing dishes. There are people who - believe it or not - actually dry the item immediately after applying the soap. Path 2 - Smart dutch dishwashing people! 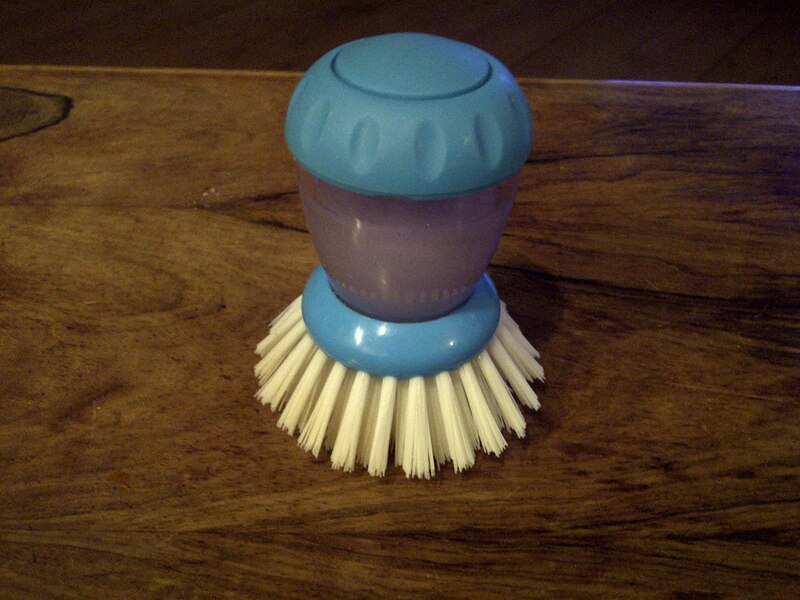 One of the most brilliant things since sliced bread is this - refillable dish brush! I was asked to bring some of those "fillable dish brushes" to Finland once, and after doing some binary search (which included e.g flying to Finland with two refillable barbeque grill iron wire things) I found the right one from Albert Heijn. Of course I had to make an investment and get one for myself. And it is absolutely brilliant! Whenever washing something by hand, you can get the perfect dose of the soap by just squeezing the thing on the top. No need to deal with those half-sticky washing mashine bottles and use way too much soap. OK, not using this daily but multiple times a week anyway. Omg I cannot believe anyone could just wipe the soap off without water! That refillable brush is handy though. Yes, I also needed to doublecheck few times before believing.. Thank you for joining in I hope you will join us more! The British was up very differently too and when I was in Spain I was always amazed that they just let the tap run. (We fill a bowl of soapy water and too let the soap stay on ;) ) I found those brushes in Spain too and took them back for family and friends!! Now I have a dishwasher here in NL so washing up is a thing of the past! How strange not to wash off the soap. I don't think I fancy that at all. Exactly my thoughts, maybe I should start a one-person-mission on getting people here also to wash off the soap.